Following my recent solo performance at the Vancouver New Music Festival i will perform the same work at the Tone Deaf festival in Kingston (Ontario) on November 7 and in Tokyo at Super Deluxe on November 10. Very excited to be in Kingston as part of the Tone Deaf festival for the first time! And as always, i’m thrilled to be in Tokyo – this time sharing the bill with the trio of Jim O’Rourke, Oren Ambarchi & U-Zhaan (tablas), it should be a wonderful night. 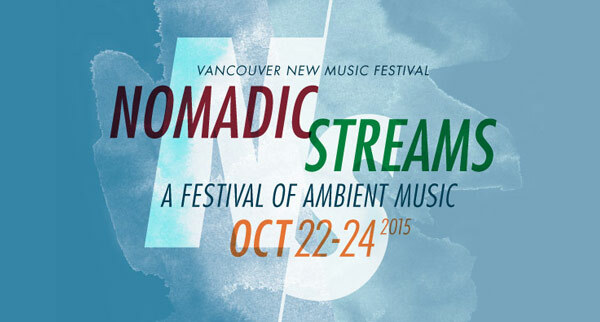 I am very pleased to be performing next week at the Vancouver New Music Festival’s NOMADIC STREAMS edition, happening October 22 – 24. I will present a new solo piece based around the hypnogogic state and will also be part of a live reworking of John Cage‘s string quartet Four – performed by the Flux Quartet in collaboration with Marina Rosenfeld, DJ Olive, Lawrence English, Rafael Anton Irisarri, loscil and souns. All details about the festival are here.